The way in which modern professionals study and work has been completely transformed by technology and the internet. More people are realising the value in studying and working from home. If you haven’t yet, don’t miss the bus! For many, the benefits of a life where both study and work can be home-based are obvious. Top benefits include in cost savings (transport), being in control of your own time management, and being able to access people and study programs that aren’t limited by location. There’s also the fact that you won’t have to put yourself at risk of accidents and hijackings while commuting to and from the office or the classroom. While the benefits are obvious, some find it hard to wrap their head around making the change from a physical classroom and office to a digital one. If you are used to working in an office and completing courses within an official classroom, you might find it a tricky transition, but with focus and commitment, it can be done and then the rewards will be wonderful! • Take time to work out a schedule for yourself. If you are the type of person to get easily distracted by family members, the television or random household tasks, you need to get strict with yourself from the start. Schedule time for work, study and home life/personal life. • Create a work/study space that is separate from the main living areas of the home. If you can separate yourself from the daily happenings of the household, you will be able to focus on work/study a whole lot easier. • Be prepared. Equip yourself. You cannot work or study from home if you don’t have the basics. You need a reliable laptop, access to the internet, everything required to make your products or complete assignments. Everything will just seem harder if you try to cut corners. • Be driven. No work from home or study from home opportunity will do the work for you. Any business you start up will require time, dedication and motivation. And it is important that you are willing to put this in. There is no such thing as an easy business opportunity or a study from home opportunity where you don’t need to do the work. Be prepared to work hard. With the benefits of studying from home and working from home being so many, it is hard to understand why more people aren’t making the transition. Don’t be left behind. Get ahead in your career and in your studies today. 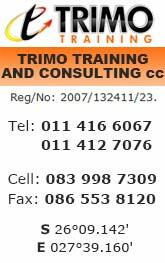 Ask us at Trimo Training for more assistance and guidance.